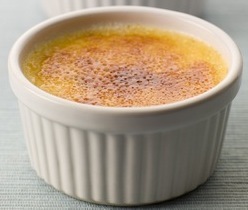 What can I say about Crème Brûlée – let’s face it, Crème Brûlée is simply perfection! I mean, who doesn’t like Crème Brûlée? And all the better when the custard is smooth and silky, and the caramelised sugar topping is just a thin layer to crack through – all delicate and light. Beat together the egg yolks and castor sugar until light and creamy. Heat the milk and cream to just before boiling point and remove from the heat and add the vanilla essence. Slowly add the milk mixture to the egg mixture and mix well. Strain the custard mixture through a sieve into a jug. Pour the mixture into 6 to 8 greased ramekins and put them into a roasting pan filled with water to reach half way up the sides of the ramekins. Bake for 20 to 25 minutes until just set. Leave to cool then chill in the fridge. When ready to serve, sprinkle castor sugar over each custard and caramelise the sugar using a blowtorch or by placing them under the grill. This entry was posted in Baking, Daily Blog, Desserts, Recipes and tagged Cooking, Creme Brulee, Dessert, Food, Pudding, Recipe, The Complete Cook Book by thecompletebook. Bookmark the permalink. This is one dessert that I will die for! Hi and thanks for stopping by! I also absolutely love Crème Brûlée. Your blog is incredible and your photography so professional. I need to get a kitchen blowtorch and try this! I wouldn’t be without my blowtorch however, don’t let not having one stop you from making this heavenly dessert, you can also caramelise the sugar under the grill/broiler.